…my colleague and friend, Kathy Sheffield, RD, LMFT. 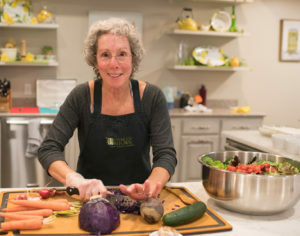 Kathy has devoted her professional life to the subject of food, nutrition, eating practices, and the psychology of eating. She counsels people, teaches, and writes on the subject of eating. After 20 years as a clinical nutritionist, presently she practices as psychotherapist and nutritionist, advising people who have eating dilemmas like overweight, obesity, eating disorders, medical conditions, and nutritional conditions. She counsels with people individually in her office in Nevada City, California, and by phone or Skype. Her burgeoning website, www.theeatingguru.com is now up and running. Check it out! Good for Kathy! I used to love it when she’d come in and interview me, and I’d try to ramp up my brain to relate to that brilliant mind of hers. Thanks for reminding me about her. I’ll check out her site. Wonderful Gary, and she is now even more brilliant with the LMFT behind her name!